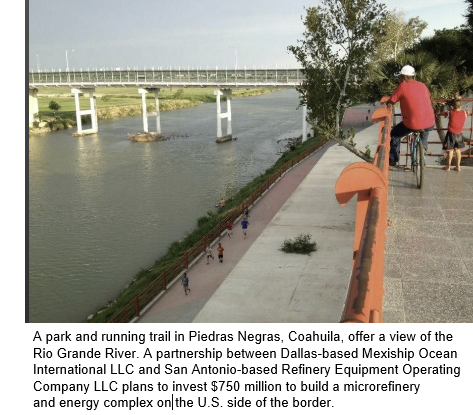 ​​​​​​​ ​EAGLE PASS, MAVERICK COUNTY – A new partnership between two companies from both sides of the border is seeking to build a small refinery as part of a $750 million energy complex. The partnership plans to build an energy park complex and logistics center in a rural area of Maverick County near Eagle Pass. The microrefinery will be capable of processing condensate or light sweet crude into gasoline, diesel and other refined products that will be exported to meet growing demand in Mexico. The proposed complex will include a 20,000-barrel-per-day refinery, storage terminals and cross-border pipelines for refined products, natural gas and fiber optic cable. The partnership includes Mexico- and Dallas-based Mexiship Ocean International LLC and San Antonio-based Refinery Equipment Operating Company LLC. Eagle Pass is home to two international bridges, an international rail line and two cross-border natural gas pipelines.